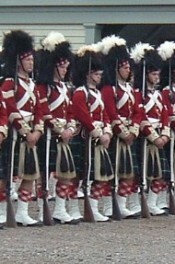 The 78th Highlanders, a ceremonial re-enactment unit at the Citadel, Halifax. 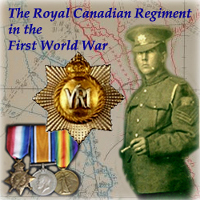 Golf Company, 2nd Battalion, The Royal Canadian Regiment. With Canada becoming an independent Dominion in 1867, Great Britain began a process to draw down her forces throughout her colonies in 1871. Nonetheless, the Empire retained garrisons in Esquimault, British Columbia and in Halifax, Nova Scotia. As years went on, and with tensions beginning to mount on the European continent, the last British fort in North America was handed over to Canadian authority at the Halifax Citadel in 1906. This year, on 23 July, the province of Nova Scotia celebrated the 100th Anniversary of this significant event in the growth of Canadian independence and sovereignty. The event was highlighted by festivities and a parade in which the new guard, undertaken by a representation from the 2nd Battalion, The Royal Canadian Regiment, received the garrison key and conducted a relief-in-place with the old guard, the 78th Highlanders. The significance of the event was visually marked by the lowering of the Union Jack and the unfurling of the Maple Leaf. BGen Parsons, Commander LFAA, noted that, "it is truly fitting that members of The Royal Canadian Regiment stand here on parade today, to highlight their role in our nation's military history, but to also highlight their role in our nation's business in the 21st century. As many will be aware, 2RCR will be deployed in February 2007, just a few short months from now, as the centerpiece of Task Force 1-07 …"
G Coy was privileged to provide the representation from 2RCR based upon 1 Platoon, under the leadership of Capt Horton, WO Thompson and Sgts Berthelot, Pay, and Lemieux. In all, 2RCR contributed 30 personnel to this event. G Coy conducted its own daily rehearsals as well as rehearsing with the 78th Highlanders. In addition, select members of the Platoon were able to participate in the Sunset Ceremony which was held on the evening of Saturday 22 July. 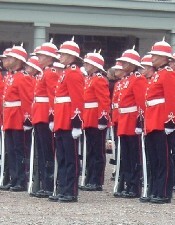 Along with 2RCR and the 78th Highlanders, participants included the LFAA Band, the 78th Pipes and Drums, the Signal Hill Tattoo Band (from Signal Hill, NFLD), the "Diehards" from Great Britain, W Battery of the Royal Regiment of Artillery, a Gatling Gun crew from California, along with countless local historical role-players. The celebration drew a huge crowd on 23 July as many locals and tourists gathered to witness the re-enactment. As the ceremony drew to a close, G Coy presented arms to the old guard procession as they made their way out of the old fort, down through the streets of Halifax, onto the pier and to an awaiting British ship. 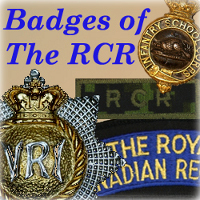 It was an event that G Coy as part of 2RCR was proud to have been a part of.